Styled with centinela skirt and ganna jacket . 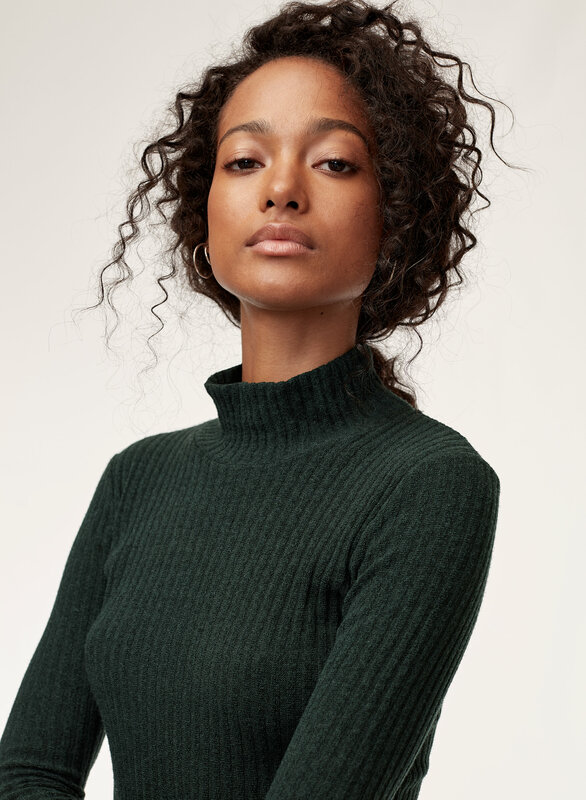 This mock neck is made with Ribbed Reposa™ — a textural version of our signature Reposa™ fabric with engineered ribbing that sculpts your body, holds you in and keeps its shape with wear. Fits well form to body. I usually get XS in Aritzia tops (especially fancy work flowy Wilfred tops) but this is pretty form fitted so I got my regular size which is a S. I wouldn't go for an M as then that would create folds in the tummy area and not look clean. My measurements are 33in bust and 26in waist. I want to get in every color! 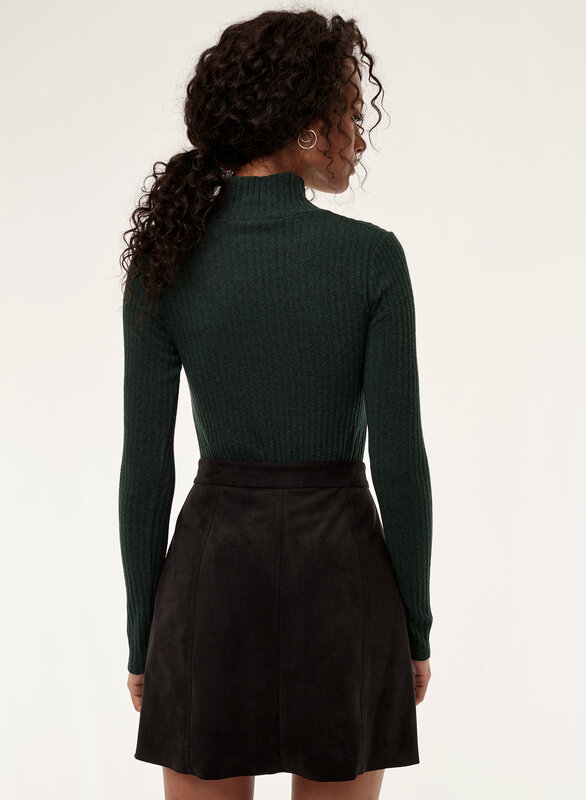 This is my ideal fitted turtleneck sweater. The material is very soft and stretchy, but keeps its shape and washes well (I always use a mesh sweater bag in the washer to prevent pilling). It's a slightly thicker fabric, so its great for super cold winter days. I love it tucked in with the jallade pant. I bought this in two colours and sized up one size for both. I got it during the online sale and am pretty happy with it. It works really well when tucked into a skirt or skinny jeans. However, I am normally an XS but found the fit for this much tighter than normal. Especially near my hips and around my arms. The sleeves are also slightly shorter than I would like. Partially my fault since I have a 24.5-25" waist but 35.5" hips, so I could be viewed as in between sizes. However, I have a Marial dress in XS that is roughty the same fabric but fits me much better. I wouldn't pay the full price for it, but it was worth $25. As long as it is tucked in the tightness isn't very noticeable. I'm usually an xs in most items but this top came out to be a bit smaller of a fit than a typical xs. It still fits comfortably but it does hug some unflattering areas like your tummy. Other than that, I definitely suggest going one size above your current size. Looks and feels nice! The fit is really flattering and the fabric is really cozy, but after only wearing it for one day there are already holes forming in the seams along the armpits so I'm not sure about the quality or how the rest of it will hold up. 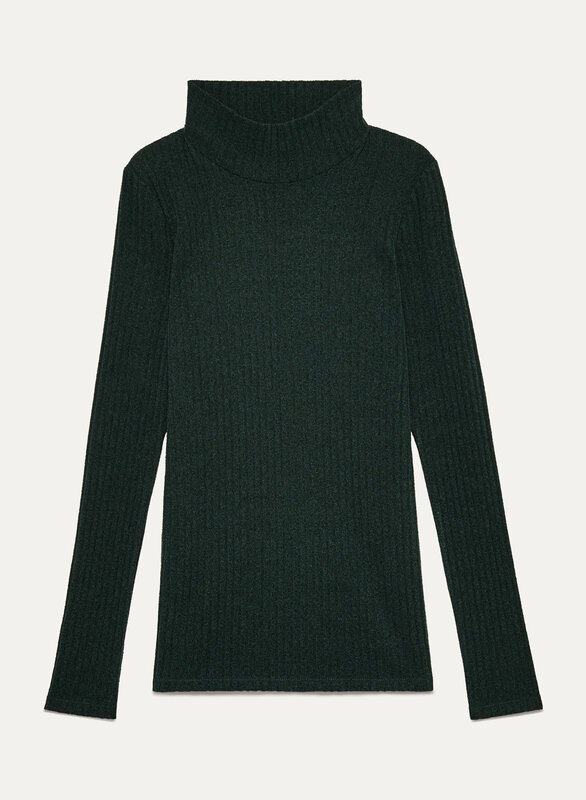 I have this in three colours, it's my favourite long sleeve turtleneck tshirt. 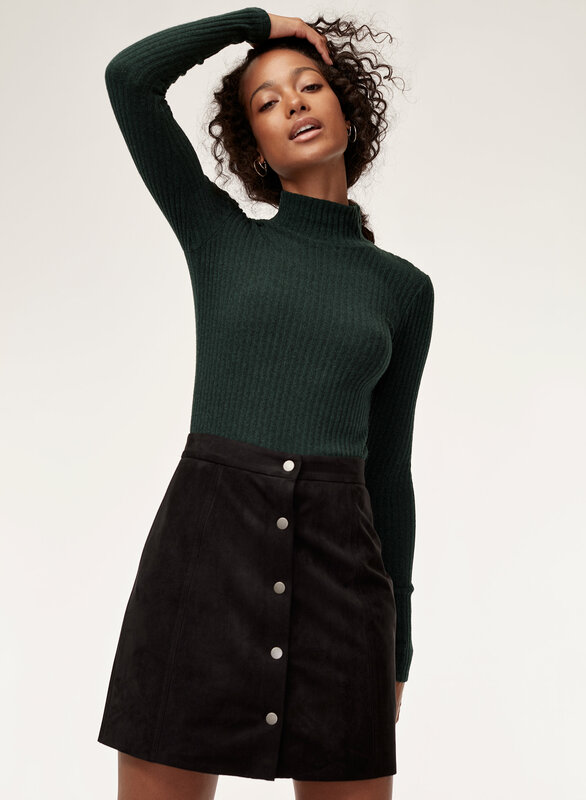 So comfy and easy to pair with anything - trousers, skirts, cardigan and jeans. Such a staple for winter. Tight and itchy, had to return. Purchased this in a few colours but unfortunatly had to return them. They fit smaller and I found the material wasn’t as soft as I was expecting. I have sensitive skin though. Size up if you plan to purchase this item. I wish every top in my wardrobe was this soft and comfortable. This top fits really small and is shorter than I expected. I love this top! So comfortable, and really chic. Why I am only rating this 3 stars is because they changed the fabric content, and I feel like it was a bad call. 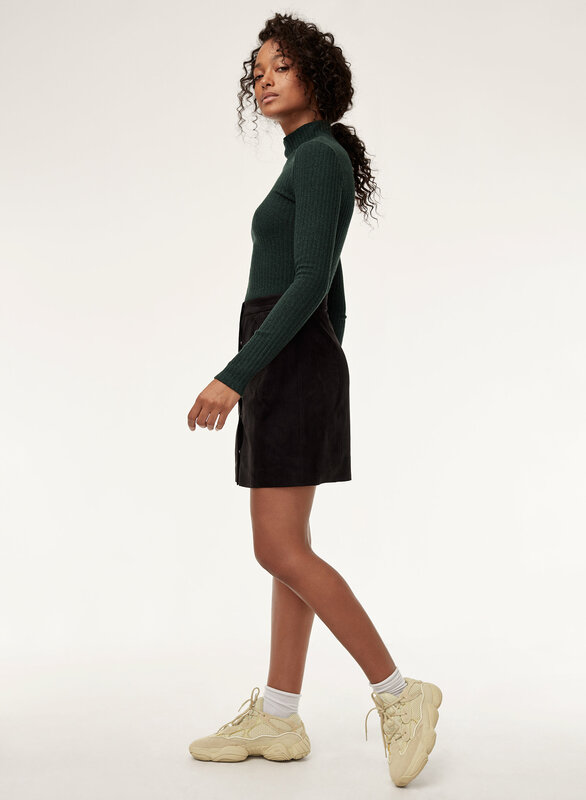 I own this sweater in the 46% polyester, 46%Rayon, and 8% spandex blend, and have tried to buy other colours, but do not like the new fabric. Please switch back to the old fabric, it washes up so well, and has made it through the dryer accidentally. 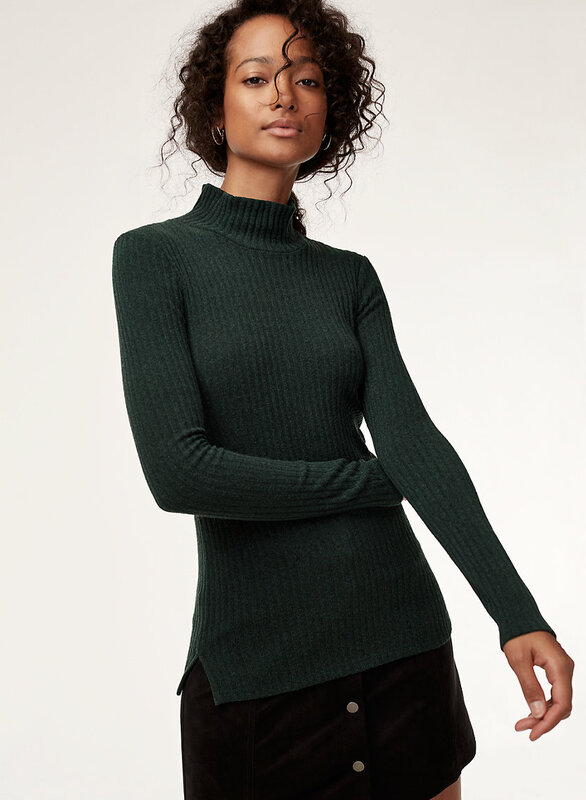 otherwise, the fit is amazing, and is that perfect form fitting turtleneck staple everyone must have!